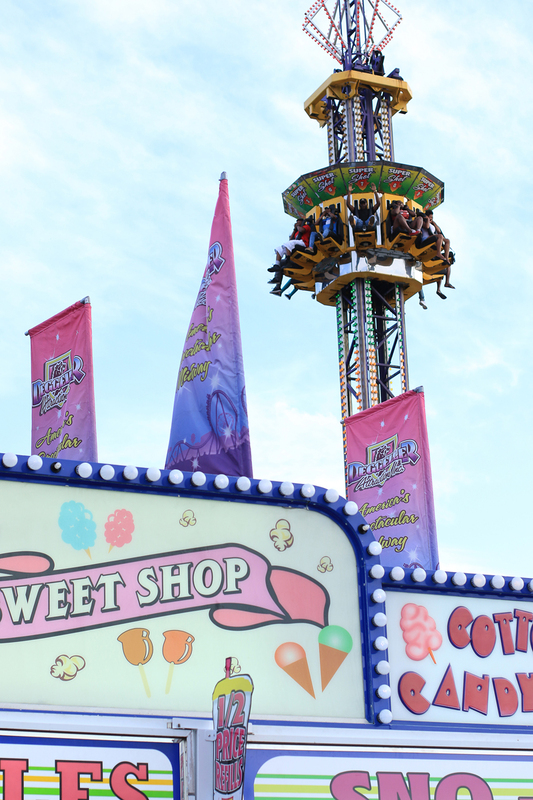 The Fort Bragg Fair is an annual event that takes place every spring. ADA parking accessible from Bragg Blvd via Howell Street. Unlimited carnival rides and live entertainment are included in one, low admission price. Parking is free. Open to the general public with easy access off Bragg Blvd. Monday – Friday, gates open at 5 p.m.
Saturday – Sunday, gates open at 1 p.m. Weekdays 6:30 p.m. and 8:30 p.m. Weekends at 3 p.m., 5 p.m. and 7 p.m.
Q: Is there a group/family package offered? A: Unfortunately we do not offer any group or family packages at this time. Q: What does admission cover? A: Admission covers unlimited rides and the opportunity to enjoy live music and entertainment! Parking is always free. Q: I lost my ID car/keys/etc where can I pick them up? A: Lost items that are recovered at the Fair are turned into the CQ office, located in the building next to the entrance of the Fairgrounds. You may also call +1 (910)908-5008. Q: I have a 3-year old and a 5-year old, what activities will there be for them? A: There is a whole area dedicated to the little ones! Q: What items are prohibited at the Fair? A: View the prohibited items list (.pdf) and bag policy (.pdf). Q: Are there any special days at the fair? A: Yes! See “Admission Specials” under “Cost”, located directly below. A: Sorry, but there are no refunds. All prices listed below include admission, unlimited rides, entertainment, and parking. Customer Appreciation Days. Monday – Friday from 5-7 p.m. $9 admission. National Superhero Day. Saturday, April 28 from 1-5 p.m. $9 admission for all dressing up as a their favorite Superhero. All ages welcome to participate. National Military Child Day. Monday, April 30 from 5-7 p.m. One military child (ages 3-9) admitted free with a paying parent. National Star Wars Day. Friday, May 4 from 5 p.m. to closing. $9 admission for all dressing up as their favorite Star Wars character. All ages welcome to participate. Cinco de Mayo. Saturday, May 5 from 1-5 p.m. $9 admission for all who come dressed in their favorite Mexican attire. All ages welcome to participate. Mother’s Day. Sunday, May 13. Mothers are admitted for free when accompanied by a paying child, who is 36″ or taller, up to age 17.